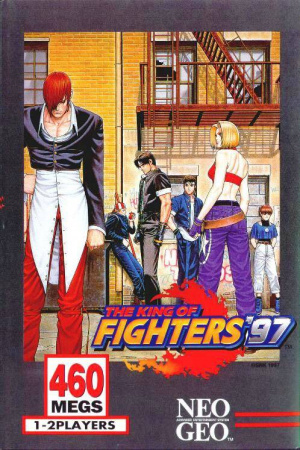 Despite being the fourth in the series, The King of Fighters '97 is only the third to reach the Wii Virtual Console, SNK Playmore having skipped King of Fighters '96 in favour of its bigger, beefier brother. Without '96 to bridge the gap, the jump from King of Fighters '95 to '97 is huge: there are six more characters for a total of 30 playable fighters, improved animation and backgrounds and more balanced CPU artificial intelligence. In an effort to appease fans of earlier titles, '97 features two play modes: Advanced and Extra. The former — based on KoF '96 — allows you to 'stock' up to three super moves as your gauge builds power, while '94 and '95's Extra gives you one gauge that you charge manually, bestowing MAX power when filled. The choice is yours, and while it's not as advanced as the Groove or ISM systems that featured in later 2D fighters it's still a welcome touch of variation. 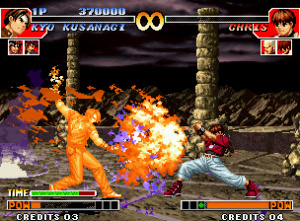 SNK included another throwback with the inclusion of a secret playable '94 Kyo Kusanagi, complementing an overall excellent line-up of favourite fighters: Iori, Terry, Kyo, Mai and Kim all feature alongside less well-known characters such as Choi Bounge, Chin Gentsai and Chang Koehan. It's a well-rounded selection that — with the exception of Kyo — stays away from alternate versions of its big names, giving you more reason to learn the rest of its 30-strong roster. Whoever you pick for your team of three, gameplay is more balanced than '95: defensive players can use Extra mode while aggressive fighters have the option to use Advanced, tipping the scales more in the player's favour. Of course it's still an occasionally punishing game and anyone picking this up as their first KoF will likely struggle at first, but perseverance is rewarded. 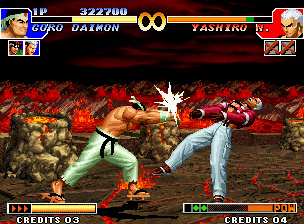 KoF '97 also features some of the best graphics and sound to come out of SNK's audio visual departments in the '90s, with memorable tunes and superb backgrounds and animation. 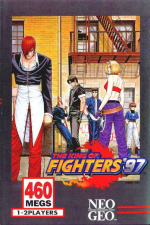 KoF '97 is an excellent fighter and a very welcome addition to Wii's Virtual Console. Like all fighting games it divides players — for everyone who prefers King of Fighters there's a Street Fighter II fan, just as Tekken and Virtua Fighter polarise opinion — but if you're after a solid scrapper you can sink some serious time into, you can't go far wrong with King of Fighters '97. Never once looked into this series. Might be tempted, it's been ages since I purchased a Wii VC game. I own 95... Is this better?? 98' is still my favourite, but this comes a close second. iirc didn't KoF97 lack background music? Anyways, its a great game... but I still highly reccomend getting it as part of the KoF Collection instead. Superior version (MVS>AES) with unlimited continues, a training mode, movelists, CUSTOMIZEABLE CONTROLS, and a whopping four other games! excellent review. for anyone who is a fan of fighting games like myself, this is definitely one worth adding to their collection. i hope SNK playmore release KOF 98 - 2003 for the V.C. be it wii or wii U. @gojiguy is that the Wii collection disk you are refering to? Yeah this version does lack background music for most of the stages - replaced with crowd cheers and sound effects. 97 is actually my worst in the series - 98 is my favourite, follwed by 95 and 96. Still, King of Fighters is always good and I'm sure a lot will enjoy this more than 95. I got the Wii Disc collection for cheap so don't need this. Nice review. I like 96 and 98 better though. I have it, Saturn version. Good addition to VC anyway. I think I'm going to have to agree. I'd have been happier if KoF96 had been released instead. '97 was good at the time but was overshadowed by '98 and didn't have the lasting appeal of '96 as an early KoF game. I'll download '97 as soon as my Wii gets back online. Excellent addition in the series. This is one of the best in KoF series (98 is my favorite), I hope it would be released in the US but NoA is being stupid and they don't like to release any good games...we were luck to get Xenoblade. This is my second favorite to 98. Just buy The KOF Collection @ gamestop for $20. Save some money, and Wii memory. I used to own '98 on my old X-box 360,but since it doesn't work anymore i am getting this for my next purchase(especially since i don't know if they will ever release '98).